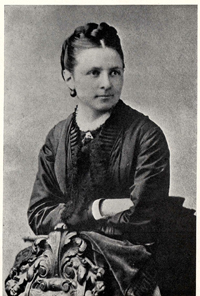 Vassar's valedictorian in 1874 returned that fall to become a librarian at the college, a position she held for two years. In a life dedicated to improving women’s education, much of Florence Cushing’s attention and energy went to the physical and academic improvement of her alma mater. Secretary in 1876 to the Massachusetts Society for the University Education of Women, in the 1880’s she helped establish the Association of Collegiate Alumnae, now known as the American Association of University Women. She was twice the association’s president and was also instrumental in establishing the Girls’ Latin School of Boston, the first Boston institution dedicated to preparing girls for higher education. She was also a founding or early member of the Massachusetts Society for the University Education of Women, the Women’s Education Association, the Nantucket Maria Mitchell Association, and the Society for Promoting Scientific Research among Women. Having led alumnae criticism in 1883 of President Samuel Caldwell that led to his resignation the following year, Cushing assumed a new kind of leadership with his successor, James Monroe Taylor. She became in 1887 the first Vassar graduate to serve on the board of trustees, a position she held until 1893 and held again from 1906 to 1912, at which point the board elected her to life membership. Resigning in 1923, she received the title of trustee emerita. During her trusteeship, Cushing served on the board’s executive committee and the committee on faculty and studies. Her friend and colleague, Christel Wilkens '00, in an obituary in the Vassar Alumnae Quarterly praised Cushing’s "unfailing energy, indomitable courage, and singleness of purpose," adding that "her judgment and advice were sought whenever the welfare of the college or the students was in question." She was instrumental in raising funds to build the New England Building in 1901 and was responsible for securing the bit of Plymouth Rock that hovers over its entrance. She and her college friend Elizabeth Houghton worked to transform the Raymond Reading Room into a place “where students could go to read, not read up,” and during the planning of Josselyn House, Cushing worked tirelessly to obtain books for its shelves. Cushing died on the twentieth of September, 1927. The Vassar Quarterly noted "Vassar College has lost one of its most loyal and devoted friends, one who gave constantly of her time and strength to the welfare of every phase of the college life." In November 1927 Elizabeth G. Houghton, ’73 established the Florence M. Cushing Fund for the Encouragement of Cultural Reading intended as an endowment fund for the upkeep of the Raymond Reading Room. Letter from VC controller to Miss Borden, 21 September 1929 in F. Cushing Bio File 1, VC Special Collections Archives.